With Kleantech's extensive knowledge of servicing all makes and models of cleaning machines in New Zealand, Mike was able to hand pick machines suited 100% to our conditions and people. NO ONE else in the market can claim this as they are always changing suppliers or models. Kleantech still sells machines we sold 25 years ago. WHY? ...because they are good and work well. Kiwis are very different breed to the rest of the world, where we FIX everything instead of replacing them, so QUALITY is 100% the top consideration. Having started selling and servicing water blasters in 1985 Mike has vast hands on experience in commercial cleaning equipment and has worked as a NZ Sales and Marketing Manager for two of the largest suppliers of cleaning machines in New Zealand at the time. Due to family commitments and a desire to change the way in which the the industry worked he set up Kleantech Imports Ltd in his home garage in June of 1991. He saw then that done right he could produce very top quality parts and machinery while also building Kleantech to be a family business where his wife and children had security in a job as well. Kleantech started out by supplying spare parts and pumps to the industry. After a short time and with a vast amount of experience fixing machines, Mike decided to look for the VERY BEST QUALITY products and and supply them to New Zealanders at the very best price. With quality as the top consideration, Mike hand picked machines suited to our conditions and people. Kleantech caters for ALL industrial situations in our country; trucking, farming, mining, factories and more. A lot of competitors buying decisions are based on price so they can extract the best margin. But if the machines are cheap they are cheap for a reason. "With a lot of junk on the market now and with Chinese parts arriving online, some people are getting a raw deal. After a number of years we took enquiries for agents to supply them new machines. The biggest complaint was 'Our existing supplier has changed modes or his supplier again.' We still sell machines we sold ten years ago. WHY? Because they are good machines and they work well. Don't fix or change it if it ain't broke. No one else has learnt this yet." Kleantech endeavours to sell via distributors where possible. This assures you get the best advice and service, often within the same day. It's possible to get a cheap deal off the internet BUT at some stage your machine will break down or will need servicing. Even under warranty these 'cheap deals' can take a considerable time to be fixed or serviced; about a week to get it there, a few days to fix, and a week to get back. Can you afford to be without your cleaner for two to three weeks? Ross retired from Kleantech in June of 2015 having been here approx 10 years. With the death of our South Island rep Ross came back to the Kleantech family in May 2015 for 2 days a week, 6 months only to help with experience which was lost with the passing of Rob. We haven't told him 6 months is up yet as you can't buy experience and him and Mike, the owner are two of the few people left in the game that can look at a 30 year old machine and "yep that's a". 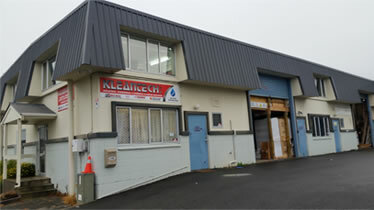 Before Kleantech Ross had his own repair shop in Auckland called Kartech Services, again bringing knowledge of Karcher machines into the fold. Warren started in November 2017 and covers Taupo North. His 20 years plus experience at Kerrick Industries make him a perfect fit to the team. Very knowledgeable, and always willing to listen to the customers makes him a very good asset and part of the team. Stuart started in September 2017 having also been at Kerrick in excess of 20 years where he ended up running the Wellington branch for them. Also with sales and hand on experience he is often capable of fixing a problem on site. Robbie was another x Kerrick employee who after again 20 plus years experience at Kerrick came to Kleantech. Robbie was only here about 8 years and unfortunately passed away at too early an age. Robbie won the hearts and minds of all his south island customers and will always be remembered at Kleantech as one of the family. RIP Roughy you were a good man. Andy joined us in March 2016 and has fast become just as important and valued as all the Kleantech family are. He has a wealth of sales experience in the South island, including sales in fire pumps etc. He loves his rugby having played at a high level in Christchurch, Will never listen to a bad word about Nelson or the Crusaders and has also won the hearts of customers. Always willing to go the extra mile and was great to stand beside when the Highlanders beat Canterbury at the Waimumu show. Andy covers the South Island. Second in charge is Mike's daughter Emma. She is considered by many to be the VERY TOP guru in spare parts in New Zealand. Emma has been working in spare parts at Kleantech since she left school in 2000. After having a wee break after having 2 children Emma is now back at Kleantech. Like a duck to water she still remembers part numbers the manufacturers still have to look up. Byron started in 2015 to bolster the very important "after sales and support team". Byron handles spare parts and accessories and specialises in Kleantech Italian High pressure hose market. Tony joined in May 2018 us as an integral part of our dispatch team along with Byron and Shaunee, keeping it all ticking over in the heart of the company. Shaunee joined us in January 2019 as part of the stores and dispatch team, another fabulous new asset and keeping the boys on their toes! (Mike's sister in law) Theresa rejoined Kleantech in January 2018 after being 10 months off with her grand children. Having also been here for about 10 years before that Theresa knows most of the product well and keeps the younger ones under control. Spare parts and dispatch are her key roles. (Mike's niece) Karla has also rejoined Kleantech after 12 months away helping in another family business. Karla processes all the accounts or whatever is needed within the company. Again fitted back in like a glove. (Mikes wife (THE BOSS)) Liz has been here about 10 years doing dispatch, spares and accounts. Again part of a well balanced team. Peter started in February 2017 doing repairs and maintenance on all types of blasters and pump. Most of which are not the ones we sell I might add. Pete is fast learning the ways of the units and now repairs in house or on site.